A bountiful summertime vegetable, the cucumber adds crunch and coolness to green salads, pasta salads and tuna sandwiches. Colorful cukes even offer a non-starchy chip alternative on your chips and dip platter. But some people experience side effects after eating cucumbers. Whether it's itchy skin or embarrassing belching, pinning down what's causing these unwelcome reactions will tell you whether you need to give up crunchy cucumbers, or simply look for new ways to enjoy them. 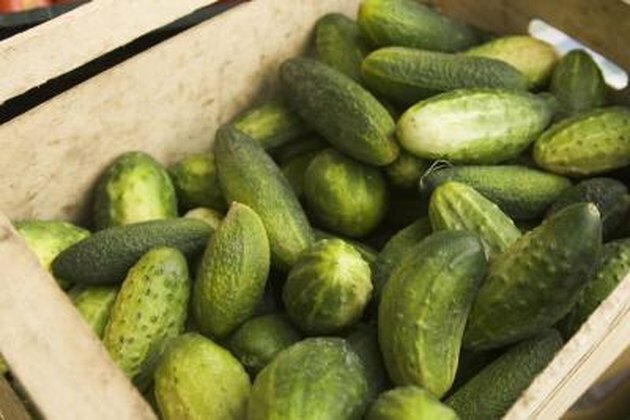 Traditional cucumbers contain a compound called cucurbitacin, which provokes indigestion in some people. Look for "burpless" varieties in the supermarket. If you grow your own, seek out seed catalogues offering burpless cucumber seeds. Breeders removed cucurbitacin from some varieties of cucumber, resulting in less gas and a less bitter taste. If your can't find this variety of cucumber, or indigestion continues to be a problem, Drugs.com recommends vegetable or vegetable dishes with a "no gas" reputation, including winter squash, summer squash, carrots and vegetable soup. Other veggies that provoke gassiness in some people include cabbage, broccoli, cauliflower, radishes, green peppers, corn and onions. Swelling or hives around your mouth, throat and tongue commonly occur with oral allergy syndrome. You may also experience itchy skin. If you have an allergy to ragweed, cucumbers may also cause allergic reactions, according to American Academy of Allergy Asthma & Immunology. A phenomenon known as cross-reactivity explains why some people with ragweed pollen also experience allergic symptoms after eating certain foods. Cucumbers fall into the ragweed cross-reactivity group, as do melons, sunflower seeds, chamomile tea and bananas. Cooking the foods usually removes the threat of allergic reactions. Since cucumbers are traditionally served fresh, however, you may find it easier to find another crisp vegetable for your salad, such as raw zucchini. The high water content and naturally chilled internal temperatures of cucumbers make them a classic summer food. Cucumbers also contribute vitamins A and C. Because cucumbers are low in calories and carbohydrates and contain no fat or sodium, they add healthy bulk to salads or sandwich fillings. People on low-carb diets also appreciate cucumbers ability to stand in for starchy chips, crackers and breadsticks. Cut cucumbers into rounds to hold creamy cheese spreads and into spears for inclusion on a crudités platter.